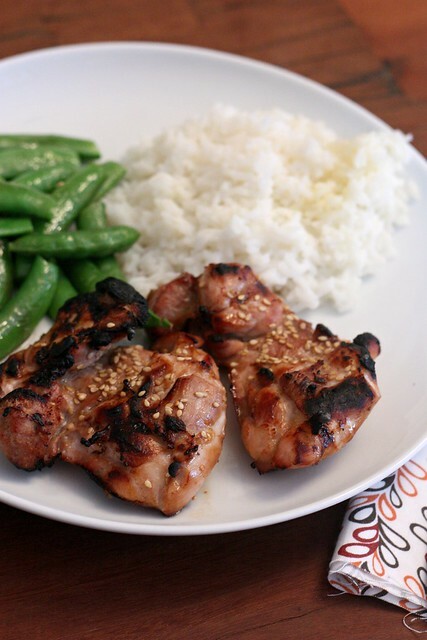 Teriyaki Chicken Thighs – Elly Says Opa! Let me tell you a little something about broiled chicken thighs. They’re the best. They take pretty much no time to cook, are endlessly adaptable, and are delicious as all get-out. Did I tell you I have a new new meal-planning partner in Zachary? I’ve been asking him what he wants for dinner for the week, and he actually has suggestions. And sure, if it were up to him, we would be eating quesadillas and brussels sprouts 24/7, but he does give other suggestions and most recently replied “chicken thighs!” within 2 minutes when I asked if he had any suggestions. Smart kid. I’m not really sure why I’ve never made my own teriyaki sauce since it’s super easy. You already know my mornings are rushed, so the fact that I had time to prep these means they take no time, really. The original recipe says not to marinate for longer than 4 hours, but I marinated them for roughly 10, certainly to no ill effects. I also used boneless/skinless chicken thighs, not necessarily because they’re a bit healthier than their bone-in/skin-on counterparts, but because they take less time to broil. Shorter cooking times on already frazzled weeknights are really the only reason to ever forgo crispy chicken skin, after all. In a resealable bag or shallow bowl, combine the soy sauce, sugar, sherry, vinegar, garlic, ginger and red pepper flakes and stir until the sugar dissolves. Add the chicken, tossing to coat. Marinate for at least one hour. Heat the broiler to high. Spray a broiler-safe pan with cooking spray. Place the chicken on the pan and broil until brown and golden, 4 to 5 minutes. Flip the chicken and broil until cooked through, about 5 minutes longer. Sprinkle with sesame seeds as soon as you remove it from the broiler.